While the Harbinger is a formidable vessel on its own, recent reports have raised its lack of flexibility as a noteworthy concern in the ever-shifting fleet tactic doctrines. Working hard to correct this problem, Imperial engineers came up with the improved Navy Issue variant. Boasting upgraded tracking systems, enhanced resilience and an advanced medium slot configuration layout, the Harbinger Navy Issue is a radical change over its predecessor, capable of astounding performance in a much wider spectrum of engagements. Released with the Odyssey expansion, the Harbinger Navy Issue is almost a straight upgrade to the Harbinger, with more fitting space, base HP and even an extra medium power slot. While the tracking bonus allows the Harbinger Navy Issue to track smaller ships with greater ease, the loss of the capacitor bonus from the Harbinger makes the already cap hungry Battlecruiser tougher to keep stable. 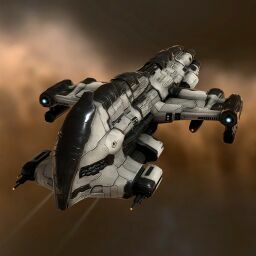 Amarr Battlecruiser to at least IV to get more DPS out of the Harbinger Navy Issue's lasers and help it track smaller ships. Drones V, Combat Drone Operation IV, Drone Interfacing IV and Gallente Drone Operation II/Minmatar Drone Operation II are all are important for getting as much DPS out of the 50 m3 dronebay as possible. Drone Navigation III, Drone Durability III and Drone Sharpshooting III are also useful support skills. No sub-article about Harbinger Navy Issue roles or piloting tactics. You can write them here. No notes for Harbinger Navy Issue. This page was last modified on 31 December 2016, at 16:36. This page has been accessed 46,677 times.